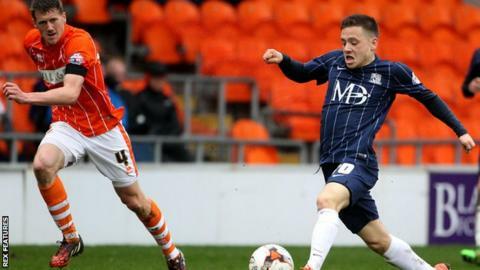 Southend United manager Phil Brown says talks with midfielder Jack Payne about a new deal have stalled. The 21-year-old, who is out of contract at the end of the season, has scored eight goals in 30 appearances for the League One club this season. "If anything, Jack Payne's contract details have fallen on deaf ears at the moment," said Brown. "Based on the fact that his agent thinks we're putting him under undue pressure." Brown continued: "Consequently Jack wants to concentrate on his football. I'd dearly love to see him sign at the football club for another two or three years, but we seem to have reached an impasse." Payne, who has three goals in his last five games, has already made 72 league appearances for Southend. Meanwhile, Brown was full of praise for upcoming opponents Fleetwood after their victory against Peterborough on Tuesday. The Cod Army's win left them a point above the relegation zone having picked up five points in three games, while Southend's play-off hopes look all but over after defeat at Blackpool. "(Southend football coordinator) Brian Horton was at the match and he witnessed a great performance," Brown told BBC Essex. "So plaudits to them for going and beating Peterborough. "I know (Fleetwood manager) Steven Pressley very well and he wants to play football, but when you're fighting for your lives it's difficult to get your football point of view across. People are nervous and there's tension involved."